A relationship forged with Vance Vice was key for the Hokies in this recruitment. A Virginia Tech offer wasn't in the cards for Brock Hoffman a couple of years ago. Hoffman turned heads at a Hokies camp during his high school recruitment, but as an early enrollee the timing for a scholarship wasn't quite right. However, Vance Vice never lost track of him, and in the end he will strap it up for Virginia Tech. 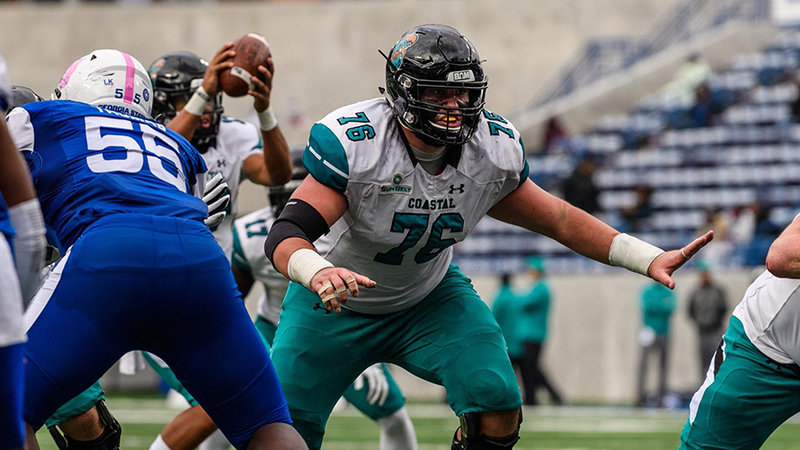 Hoffman announced his transfer from Coastal Carolina to Virginia Tech on Friday. "Once summer comes, [Vice] wants me to hit the ground running," said Hoffman. A trio of reasons factored into the move: CC head coach Joe Moglia stepped down, his desire to compete against NFL talent, and primarily to move closer to and care for his mom. The latter point is the thesis for the waiver to gain immediate eligibility. Blacksburg is about 2 hours closer to the Statesville, NC native's home than Conway, SC.